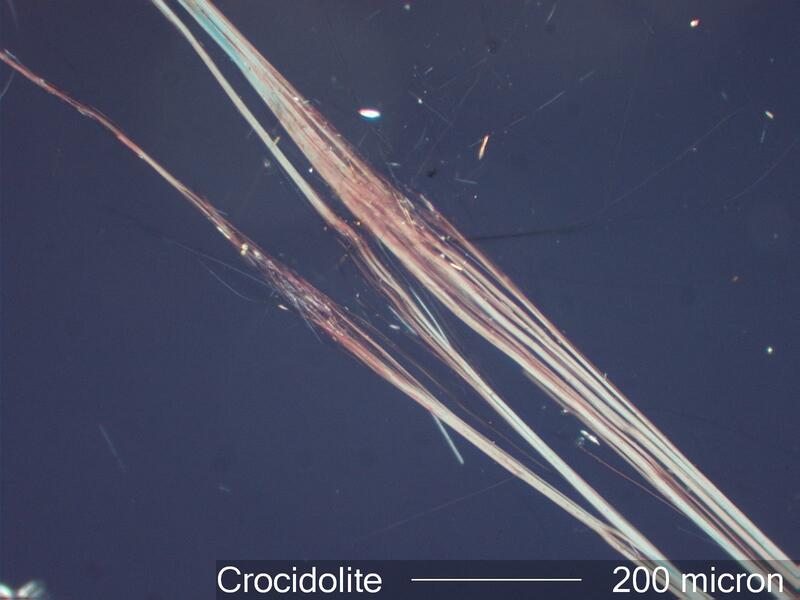 Crocidolite asbestos, the blue asbestos, is a fibrous amphibole with the chemical composition Na2Fe 5[Si8O22](OH) 2. It is one of the more hazardous asbestos minerals. Crocidolite is the third most common commercial asbestos, behind Chrysotile and Amosite. It is used in the blue ceramic water pipe that was used widely in the past. It was commonly used in high temperature environments, like boiler. It is the only asbestos other than chrysotile that can be easily woven into cloth. It is rare as a natural mineral so when it is found in an environment it is usually the result of the degradation of an asbestos containing construction material. The blue color of Crocidolite is unique in the asbestos minerals though there are some other blue or blue-green mineral fibers. It has relatively high refractive indices, around 1.705. It has a dispersion of the birefringence that is visible in thin fibers. For these thin fibers they appear pink between crossed polarizers. For thicker fibers the blue absorbs most of the red end of the spectrum and the fibers appear blue. This is a very characteristic feature. Crocidolite is often used with Chrysotile asbestos. 6. Riordon, P. H. (ed), GEOLOGY OF ASBESTOS DEPOSITS, Society of Mining Engineers, 1981. 7. World Health Organization, ASBESTOS AND OTHER NATURAL MINERAL FIBRES, Environmental Health Criteria 53, 1986.